You're browsing: Home / Meri awaaz suno / Humility, thy name is Rafi...? Your piece has touched me. You have left nothing for me to say about his singing and his songs. However,I would like to say something about the man. Many many years ago a neighbor of mine was privileged enough to attend the recording of the Rafi-Manna Dey number, “Ek jaanib sham-e-mehfil”, from I think Abhilasha. He said while Manna Dey left immediately after the recording, Rafi spent time talking to every musician, checking if they needed anything. It is said that after every successful recording, Rafi would distribute sweets.No wonder his voice was so sweet! And finally, I must tell you about this American colleague-of Pakistani origin-of mine. When he landed in Mumbai, he had only one mission- to visit Rafi sahaab’s mazhaar. I showed him Shahrukh’s house, Amitabh’s house, etc. but he was least interested.I finally took him to Rafi’s grave and his life’s mission was accomplished.The grave is very simple-no epitaph nothing.He wanted it thus it seems.Simple and humble in life..and death. My dear friends, I happened to cross Mohd Rafi Chowk last week during a business trip to Mumbai. I once again found just a simple block with the words Padmashree Mohd Rafi Chowk written on it. Rafi Saab would never have asked for anything. But I ask and I am sure you will all join me in asking. Doesn’t he deserve much more? When lesser mortals are heaped with all kinds of titles and awards, what can one say for Rafi Saab? He was the greatest. And he deserves the Best. This entry was posted on Sunday, December 13th, 2009 at 9:37 am	and is filed under Anecdotes, Meri Awaaz Suno. You can follow any responses to this entry through the RSS 2.0 feed. You can leave a response, or trackback from your own site. said that she loved the song ‘Aaj Mausam Bada Be-imaan Hai’ from the film ‘Loafer’. with which Rafi Saab was made of ! 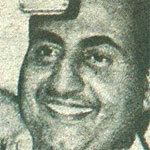 What can one say about the Maestro Mohammed Rafi – The Greatest playback Singer. I cannot think of another singer who can hold a candle to him. Or another singer who can stand on the same stage as Him and sing. His humility & generosity makes him a great soul too. In the case of Janab Mohammed Rafi Saab awards are irrelevant. No award can do justice to Janab Mohammed Rafi Saab. In fact, He brings recgnition & meaning to the awards. I shall be ever grateful to Him for the countless number of hours, days & years of pleasure I have enjoyed listening to his songs again & again. I have one regret though – I could not listen to Him in a live performance. I would have loved to donate 5 years of my life to Him. Here was a “Ceasar”, when cometh another? Very well written to express the “par excellence” voice of Rafi Sahib. Surely, there will not be any singer like him for years and years to come. May God bless his soul. rafi saab was a angle sent by god for us to feel the sweetnes in melody in other words he was a farishta a good human been without any ego.he was a natural ,as I heard from one of his interview on tv long back when he was a child he was inspired to singing at the age of 5 or 6 ,when a fakir in his village used to sing songs and ask for alams ,then rafi sahab as a child used to follow him and immititate his voice by this way he got the inspiration for singing he was a natural god sent angle. Achalji, short and sweet note which conveys a wealth of meaning and captures the essence of rafi saab. aadab aur salam ke baad aap tamaam rafian ko aaj ke iss mubarak din pe bahut bahut mubarakbaad. itzz me MR JAVED MOHAMMED KHAN!……26yrs old! im too great MOHAMMED RAFI SAHAB FAN!………….EVR N EVR! My oronam to Rafi Saab, He has proved his Musicality. When I will have the opportunity to visit India one day, one of the first places to visit is Rafi Saab’s grave and his house and if possible to meet some of his family. Although his memory is always with us through his thousands of his songs but I always question often why was this humble kind gentle man taken from us from a young age especially when he was once again back on top. I wished I could have met him and embraced him. Sometimes, you need to say very little to convey the appropriate message, and this is exactly what you’ve done. Thanks for a lovely note! mohd rafi is not Bharat ratan only but world Ratan, This week i was looking at tv they was speaking about Dilip Kummar but no name of Naushand Ali or Mohd rafi came out i agree Dilip Kummar ji is great actor but it be ok if Naushand or Mohd Rafi name not came out but the unfair is that they spoke about the KA gave great music for dilip kummar in film in which there is no Mohd Rafi song!!!!!! no one can stop sun light to shine on the earth even at night we can see sun light from moon,stars not be able to give us sun lights even moon light …..
Rafi Sahib ko kisi cheez ki zaroorat nahi hai,main apne aap ko Rafi Sahib ka sab se bada fan samjahta hoon,aur jante hain kyun?,sirf aur is liye ke Rafi Sahib ne apni God gifted awaz ko sirf aur sirf hum sab ke liye sambhal ke rakha,bohat bohat shukariya Rafi Sahib. If you are hinting at awards, I personally feel all these awards have been devalued after serving them on some undeserving people. I would rather say that Rafi Saab has got the highest possible award from all music lovers, ‘their love, affection and respect’. What else one needs? do we need or require anything more than this??? padma shree, padma bhushan and padma vibhushan awards and rewards like these are too small for a legend like rafi sb. he should have been awarded ” bharat ratan” in his lifetime, it is not the bad luck of rafi sb or the rafi lovers it is the bad luck of those authorities who are still unaware of their responsibilities to be executed. Rafi sb lives in our heart in our memories and in our breathe, we consider him as “bharat ka ratan”. nobody and no circumtance can erase the name of the greatest legend from either from the deepest core of our heart or from the pages of indian music. he is immortal, incomparable, legend, thespian, versatile…….. and words end up when we start writting about this angel of music. Dear Achal saaheb : there are millions of rafi saaheb lovers in the world. in came an young lady and seeing the photographs of mohd rafi, lata, talat and kishor asked me : who is the author of the book….? when i said that there is a rafi club in borivli, her face once again beamed and said where??? i said just here……….. I will invite u for the listening sessions or the documentary shows. she was happy . she immediately wrote her name and nos. she is a great rafi fan . her name, dr.vasudha……. i was happy to meet one more rafi lover. the picture at the bottom of this article having rafi sahab’s photograph put above the mazhar, i remember that day. it was 31st July 2007, me & friend sirish kulkarni had placed the framed photo & garlanded it. binu nair was talking with the visitors amongst them our dear raju korti was also there. the day at the mazhar was full of uncontroled emotions for us. tears were rolling down every now & then. all the time there was only one discussion. it was all about the simplicity & helping nature of rafi sahab. achalbhai adabrafi. thanks for posting this short but thought provoking write up and many thanks for bashir shaikh’s observations too. rafi sahab, as we all know was a very modest person and someone who cared for fellow human beings much more than most famous people do often. but then again, rafi sahab was too publicity-shy for such gestures to have been oft written in film magazines of those years. You have raised a pertinent question, time and again echoed by many rafi fans :”Rafi Saab would never have asked for anything. But I ask and I am sure you will all join me in asking. Doesn’t he deserve much more? When lesser mortals are heaped with all kinds of titles and awards, what can one say for Rafi Saab?”. This morning i was talking to gurbeer singh of lucknow who too lamented that nothing much seems to have been done by anyone and now perhaps it is time we the rafi bhakts rose as one to do something. he will on his own try to write his mind, perhaps on these columns too. let us all, the rafi bhakts, first unite under any one common platform and then decide the course of action that we must all take. if you go back to some of the backpages of this website, i had written an article “clarion call to bollywood” urging the film industry to pay back to rafi sahab in good measure since for more than two decades, rafi sahab’s songs were the main reason for many films to have succeeded at the box office and many a actor rose to fame lip singing to his melodious voice. your article thus is a reminder for rafi bhakts to act. rangajee – you are lucky to know mr.basheer for the last 23 years – but – i would like to tell you that – we rafi bhakts are all basheer’s in our own rights, you, me and all the bhakts in this dedicated web of our dear rafi sahab. basheer, said it in such simple words, simple things about our simple but true rafi sahab. as it always happens, people always lament after a person departs. a father always tells his son or sons, you all will realise about life only after my demise. in our case we all knew, the divinity of rafi sahab and never left his side, stuck on with him steadfastly through these years, but, the concerned authorities, reponsible for bestowing awards, have actually abandoned him, simply because – they wont be paid any money for giving an award to rafi sahab. if we can see manna daa, not so very excited about the award – one can make out the general behaviour of our indian leaders towards our legends. if a living legend is treated in this fashion – what about our dear dear dear rafi sahab. another thought always comes to my mind as a fleeting thought and that is – the mangeshkars – cant they see this great insult being heaped on the maestro and cant they show their anger to the authorities. if they truly respected their one time colleague – they can attain moksh by strongly lobbying for rafi sahab to be awarded the highest civilain award of our country. an extremely neat, nice and nationalistic article by you – rangajee – congratulations a truly good one.